"A Half a Million Bob Seger Fans Can't Be Wrong!" With over 500,000 Downloads/Streams/Sales of the "Turn The Page - Tribute to Bob Seger" recordings on services like Itunes, Spotify, Rhapsody etc....the fans are proving that "Turn The Page" is the most musically accurate and best sounding Bob Seger Tribute to date! The Live "Turn The Page " show brings that same energy and excitement to the stage as they faithfully reproduce all the Bob Seger classics that have made him a Legend. The only way to get a more authentic Bob Seger experience is to see Seger himself. 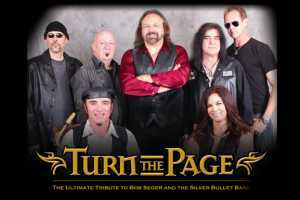 Find out why CNBC News has called "Turn The Page" one of the nation's top tribute bands! Give us a listen...."Turn the Page" will provide the "Old Time Rock and Roll" that will make you remember why "Rock and Roll Never Forgets"